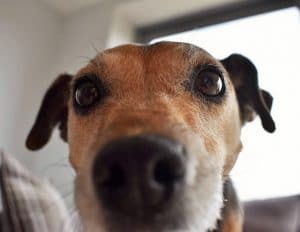 Ruby is a very smart Jack Russell Terrier X Manchester Terrier of 9 years who came into the Oldies Club rescue after her owner sadly passed away. 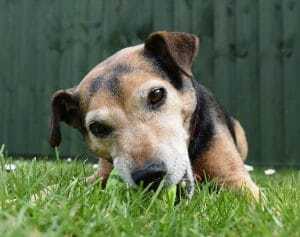 She’s now in an Oldies Club foster home in Gloucester while she waits for someone to offer her a permanent home. A good girl in foster: Ruby settled in to her foster home after about 10 days, assuming ownership of all the good toys! Can be left for a few hours: It’s thought Ruby could possibly live in a working household, as long as she has a lunchtime walkies or garden break. She does love company but has proven what a sensible girl she is, when left for a while. Good with some dogs: Ruby is sharing her foster home with a male Collie and another Terrier. She was nervous of the Collie at first, as she is with most large dogs, but soon realised he was nice and all is now harmony between them. The other Terrier though, has traits very similar to Ruby. They both want to be top dog! It’s thought that Ruby had better not live with a Terrier (or another dog who’s bossy, like her) but she might be happy living with a placid dog, capable of following orders! She’d certainly be content as an only dog, being the centre of attention. 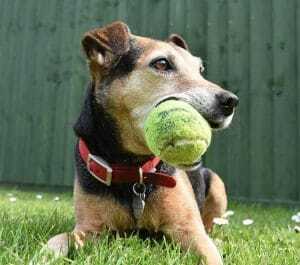 Unknown with cats: Ruby hasn’t met any cats since being in foster and being a Terrier, she might consider them to be particularly lively toys for chasing. Good with children: Ruby has lived with children before and she should be OK to again, as long as they’re respectful and aged 10+. She would have strong views about being picked up all the time and must be allowed her own space. Not to mention her own toys! Loves her walks: At the moment, Ruby has two walks a day of about 30-40 minutes. This suits her nicely but she wouldn’t turn her nose up if you wanted do more! She gets very excited during the pre-walkies ritual and can be vocal, but she’s quiet again once she out. She walks well on the lead and is happy walking beside other dogs that she knows. Her recall has been good when loose in the garden and when on an extendible lead, out in the open. OK in the car: Ruby is still getting the hang of car rides. She’s sometimes vocal when she first goes in but then settles down. Practice will probably help. Ruby’s favourite pastimes: Food is Ruby’s all time favourite thing, closely followed by toys and she’s partial to fuss too. Any toys will need to be very sturdy as Ruby has amazing toy-destroying powers! Ruby’s dislikes: Fireworks and The Vet! Ruby’s ideal home: She would love to live in a settled home where someone will be with her much of the time and will appreciate her following them around to be helpful. She could live with another dog who accepts her natural authority but would probably be happiest as an only dog. A garden and supply of tennis balls are essential! Health notes: Ruby is spayed, vaccinated, microchipped and worm/flea treated. She was taking Propalin syrup but has been off it for two weeks now and is absolutely fine. She’s a robust little lady! 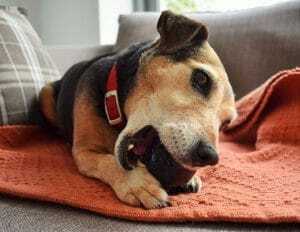 Ruby can be rehomed anywhere on the UK mainland, subject to a satisfactory home visit, but note that you will be required to travel to the foster home to meet her.